Harry Styles – now Hazza S actually has many, many bad tattoos but for the purposes of this article we decided to just choose one. After careful consideration and the discarding of many other, slightly less awful inkings we decided to go with the George Michael lyrics he has adorning his ankles. And not just any George Michael lyrics; ‘Never Gonna’ around his right ankle and ‘Dance Again’ round the left (for non-fans, they’re lyrics from the schmaltzy 80s ballad Careless Whisper). Cara Delevingne – when you’re a model, getting tattoos covered for shoots costs time and money – which may explain why model-of-the-moment Cara has one on the sole of her foot. Doesn’t explain why it says ‘Bacon…’ though. Tulisa Contostavlos – not doing her reputation as a bit of a chav (sorry T) any favours, the former X Factor judge has a tattoo of a four leaf clover with ‘Lucky You’ inked next to it. Which is all fine, really, until you consider the location; directly above her pubic bone. Kelly Osbourne – another one for the ‘why that and why there’ archives, Kelly O has the word ‘stories’ tattooed on the side of her head in capital letters. At least she can choose whether or not to show it off by getting a haircut, but still. Sarah Harding – the former Girls Aloud singer has the phrase ‘Don’t be Bitter, Glitter’ tattooed across the top part of her back. We have literally no words to describe how we feel about this – nor can we even begin to comprehend why on earth she thought it was a good idea. 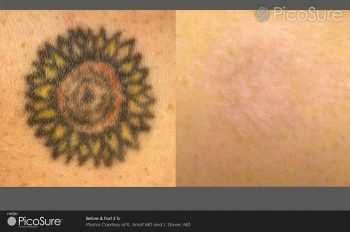 If you have a tattoo which you regret or would like to remove, please visit our tattoo removal page.